April 03, 2014 AF Digital April 2. The Philippine-born musical genre called “kundiman” is slowly disappearing, at least to the ears of Filipino migrants in Australia. But it has found an unlikely guardian in the form of a seniors choir based in Sydney. MICHELLE BALTAZAR writes. In the beginning, they hung out simply to enjoy Filipino cuisine including pinakbet, a simple but delicious dish from northern Philippines made of mixed vegetables steamed in fish or shrimp sauce. But what started off as social gatherings or barkadahan in their senior years (many of them are in their 60s) blossomed into a closer friendship over something just as important to Filipinos as good food: great music. 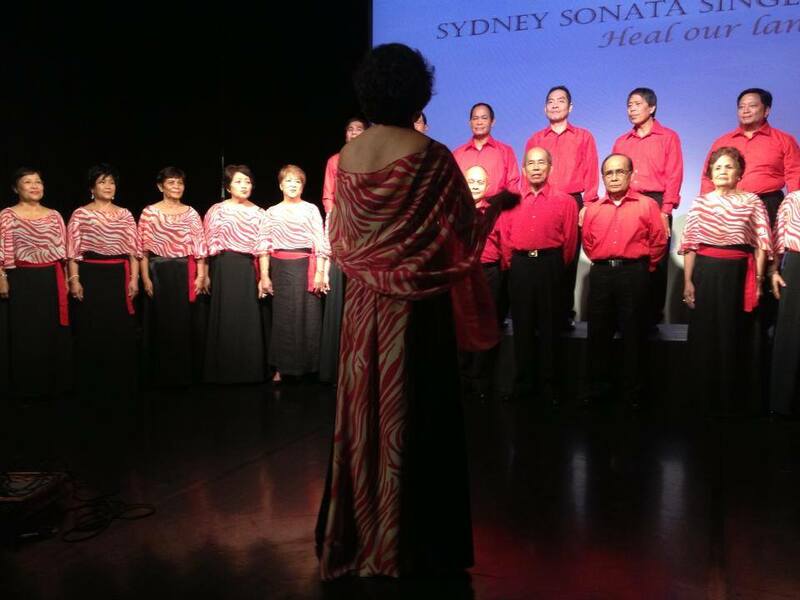 That was why, in 2011, five couples formed a choral group called the Sydney Sonata Singers led by Louisa ‘Loy’ Tagudin. 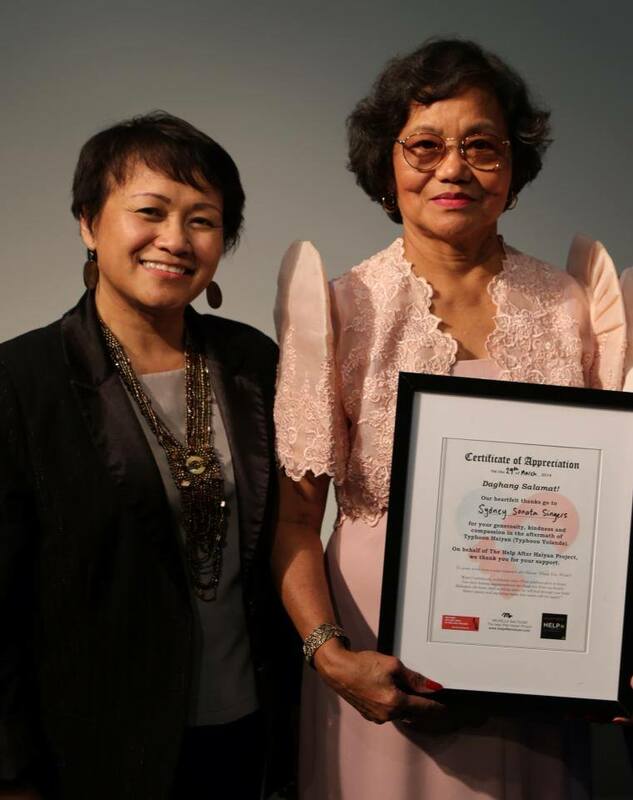 Manang Loy, as she is endearingly called, is an accomplished choirmaster and multi-awarded music teacher who graduated with a Master of Arts in Choral Conducting and Musical Composition back in the Philippines. A music scholar, she has already retired from her teaching career when she moved to Australia. But as a migrant, she had a second and third career – working at Commonwealth Bank as staff and part-time at retailing giant Woolworth’s. But as they say, once you have a passion that burns within you, it stays with you forever. And so it was that when she found out that her barkada could, surprisingly, all carry a tune and harmonise beautifully, the Sydney Sonata Singers choir was born. Last Sunday, they proved to a sold-out audience at Blacktown Arts Centre that they can put on a show, not just a karaoke performance. Starting off with a set list called a ‘Tribute to Country’, a group of seven Soprano I (female), seven Soprano II (female) and 11 altos (male), the 25-member choir got the crowd all homesick and nostalgic with popular patriotic songs including Sa Sariling Bayan, Perlas Ng Silangan, Ang Bayan Ko, Barong Tagalog and Dalagang Filipina. A kind of cultural immersion through music. Their show built up to a crescendo during the second part when they sang May Bukas Pa, Sinumpa Ko Sa Diyos, Aawitan Kang Lagi, and particularly poignant given they were raising funds for typhoon Haiyan survivors, their rendition of Visayan song Usahay (Sometimes). Even seasoned Master of Ceremonies Rod Dingle exclaimed that he’s emceed many concerts before and so few matched that heart and soul that came with the Sydney Sonata’s performances. Add to that the exquisite Filipino costumes they wore to suit the mood of each song and it was no surprise that the group has bagged several awards and in-demand to perform at so many community events. The icing on the cake is that they also invited Miguel Castro, a visiting Filipino celebrity artist and Marcus Rivera, who received a rousing applause for his pitch-perfect rendition of Italian soprano aria O Mio Babbino Caro (Oh, My Beloved Father) and his duet with choir member Cecile Germo on a kundiman (traditional Filipino song of love and courtship) called Pakiusap. Adding to the carefully chosen performers on the day were Ace Boncato, the Carinosa Dancers and the professional singing diva and superstar ng bayan, Lillian de los Reyes. Now that many in the Filipino community know who they are, it was only a matter of time before the rest of Australia follow. In a remarkable feat, the choir has been invited to perform at the prestigious Biennale of Sydney, a once-every-two-years contemporary visual arts festival held in Australia. 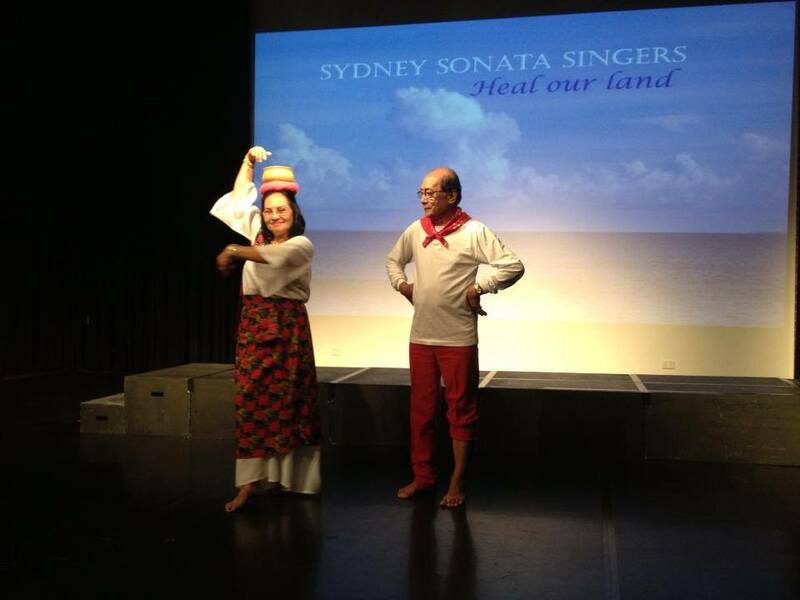 Started in 1973, the Biennale is now one of the leading international festivals of contemporary art and on April 26 at the iconic Cuckatoo Island, the Sydney Sonata Singers will make history by showcasing traditional Philippine folklore and kundiman. Tagudin and the group decided to share the legend of the pineapple or pina at the Biennale. Accompanying the narrative is the kundiman ‘Baleleng’ which, on the day, will be performed in both Tagalog, the widely-spoken Filipino dialect and Tausug, the dialect which the song originated from. Their commitment to preserve a slice of Filipino culture and their musical talents earned them an artist’s residency at Blacktown Arts Centre – yet another feather to add to their (collective) cap. The Centre’s performance curator Paschal Berry, an advocate of the Filipino culture himself (he has written plays and co-created art installations highlighting all-things-Filipino), is a fan. He helped facilitate the choir’s request to use the Centre’s space for free so they could run not one, but two, fundraising shows for typhoon Haiyan/Yolanda survivors. 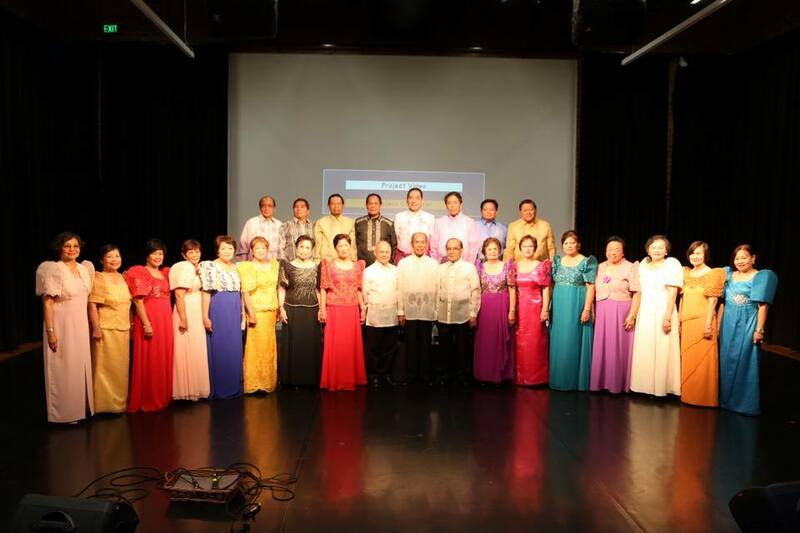 The choir raised a few thousand dollars from the event, all of which they want to donate direct to those affected during the super-typhoon. Tagudin credits her friend and choir co-ordinator Ester Creencia for ensuring that all choir members learn their parts as and when needed. Creencia keeps them all in line, she jests. Rather than devote all their weekends practicing, Tagudin will do the musical arrangements and give them all a recording CD (with help from musical arranger Arthur Esposo) on the first Saturday of the month. “By the third Saturday, which is two weeks after they received their practice CD, they will have already memorised the songs and practiced their assigned harmonies and melodies,” said Tagudin. “Wala ng kopya pagdating sa practice. Memoryado na nila yun,” she said. Tagudin said what that means is that while they are babysitting their apo or grandchildren, or looking after chores at home, or simply relaxing in the house, they would have their practice CD (with Tagudin singing their part) playing in the background. “Sometimes they will put their grandchildren to sleep while they are singing or playing the practice CD. Our kundiman songs or sometimes English songs become the baby’s lullaby,” she said. The choir performs mainly for community events and charity concerts so it is very rare that they get paid for their performances. The money they raised at their last two fundraising plus the proceeds from their CD sales (yes, they have a CD) all go towards typhoon Haiyan survivors. But no amount of money can equal the sense of fulfilment that each and every member of the choir gets from singing. “We are all retired now and I know that with the choir members, they really get a lot of happiness from singing and preparing for our shows,” she said. The oldest member is 79 years old (and he still did a solo last Sunday) while the ‘baby’ of the group is only 59 years old. Majority of them are in their mid-60s. Tagudin explains that as you get older, your vocal chords can weaken and they may not be the same as they were but you would think that the choir members are at their peak when you hear them sing. That’s because Tagudin puts in a lot of time and effort in vocal arrangements, ensuring that their songs are arranged in a way that everyone can comfortably sing and allow ample time in between for breathing between challenging notes. She may impress upon them the importance of technique but it is really the heart on every note that the audience remembers as the choral group bows and leaves the stage. Tagudin said she will keep conducting and give vocal coaching for as long as the choir needs her, and for as long as they are all having a blast doing it. To date, the Sydney Sonata Singers have sang, memorised and performed an amazing stockpile of 60 songs. They perform each and every one of them with the fervour of youth, proving that music is both timeless and ageless. And to think it all started from a plate of pinakbet.